Ann Genovese is a Senior Lecturer and Programme Director of the Australian Legal Histories research programme at the Institute for International Law and the Humanities at Melbourne Law School. Ann is an interdisciplinary scholar with degrees in both law and history, and her PhD in History, The Battered Body (1998) focused on the interrelationships between these disciplines. Her research since that time has continued to interrogate in different ways the history and theory of the relationship between Australian law, the State and political culture. 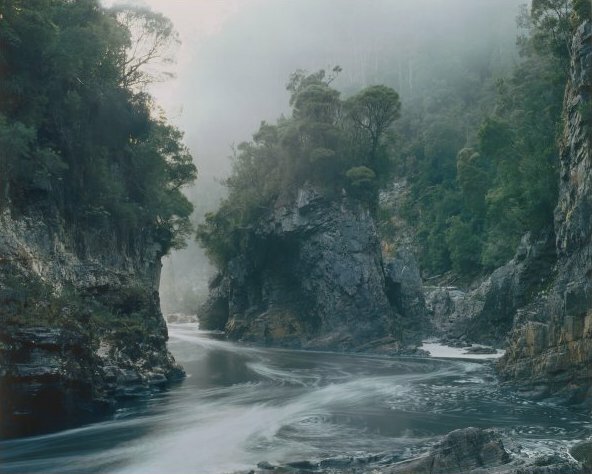 Peter Dombrovskis, ‘Rock Island Bend, Franklin River, Southwest Tasmania’ (1983). 2012 and 2013 mark the respective 30th anniversaries of the High Court’s decisions in Koowarta v Bjelke-Petersen  HCA 27 and in Commonwealth v Tasmania  HCA 21 (the Tasmanian Dam case). Each of these cases is commonly understood to represent a turning point in Australia’s legal and political history: a shift to a different form of political engagement on complex questions about race, and the environment; and a shift in what those engagements could signify, nationally, and internationally. Cumulatively, the cases are also understood as marking a decisive jurisprudential turn, a consideration of a different engagement by the High Court of Australia with both international law and the politics of federal constitutionalism. After 30 years, it is timely to reflect on the ongoing significance, in political and legal terms, of these two ground-breaking cases; yet also to review the complex ways in which the cases are remembered or understood as turning points. Two symposia hosted at the Melbourne Law School commemorated these anniversaries and the proceedings will be published in two special issues of the Griffith Law Review.